As technology and business come together, Emily Hirao is well-versed on how she can use a multifaceted skill set to help her forge a professional future — by focusing on data analytics, the process by which meaning can be derived from information. Hirao, a senior studying business technology at Carnegie Mellon University, shared her experiences as a paid student intern on Wall Street working her way through 50 to 60 hour weeks last summer. At an event co-hosted by Pitt’s Business Technology Association and CMU’s Business Technology Club, between 15 and 20 students gathered Monday night in room 230 in the Cathedral of Learning to listen to Hirao talk about finding internships in the field of business technology. As a former Deutsche Bank intern, Hirao gave advice to business and nonbusiness students figuring out their careers and looking for ideal internships. Hirao advised that students looking for internships should actively seek out opportunities and establish contact with companies hiring interns. She remembered her experience at Deutsche Bank and talked briefly about the cruise she was able to go on while working as an intern along with other benefits, such as free food. Hirao also mingled with top employees, worked with a mentor and networked with other interns. She was even called back for a position at Deutsche Bank but declined the opportunity because she did not like “the hustle and bustle” of New York City. Hirao’s experience in the business world allowed her to gain insight, which she wanted to share with other students who were just branching out. She made a few course suggestions for first-year business students in particular. “I would say definitely to take a few very technical courses,” Hirao said. She also said these courses would be especially helpful for student when applying for internships. For Hirao, the fast-paced culture of Wall Street and her experiences at Deutsche Bank offered her alternative insights into the ways data analytics are used. Hirao addressed the challenges for students trying to make their way into the professional world. “The hardest aspect was the sense of competition within the bank, because everyone was trying to further their career,” Hirao said. David Qin, a senior finance and business information systems major at Pitt, thought Hirao’s talk was especially helpful since he is involved in a field that directly corresponds with data analytics. He said a better understanding of the topic will help him maximize his career potential. Qin thought it was crucial for students to learn about firsthand experiences like Hirao’s and to understand data analytics in order to get a proper internship. “I think that it’s important not just for me but for our younger members on how to get internships,” Qin said. Gabriel Aoki, a junior economics and philosophy major at Pitt, attended the meeting to gain a better understanding of the tools necessary to comprehend the fields he is closing in on. Aoki said he needs a firm background in economics and an understanding of data analytics to pursue the vision he has for his future. “I plan on starting businesses, and obviously data analytics is something that is a very big part of it, so definitely it will help me indirectly,” Aoki said. Kai Gentile-Manigault, a statistics major at Pitt, came to the meeting because he heard someone was giving a talk on data analytics. He was eager to attend and said data analytics is the reason he is a statistics major. “I’ve always liked math and things with numbers,” Gentile-Manigault said. 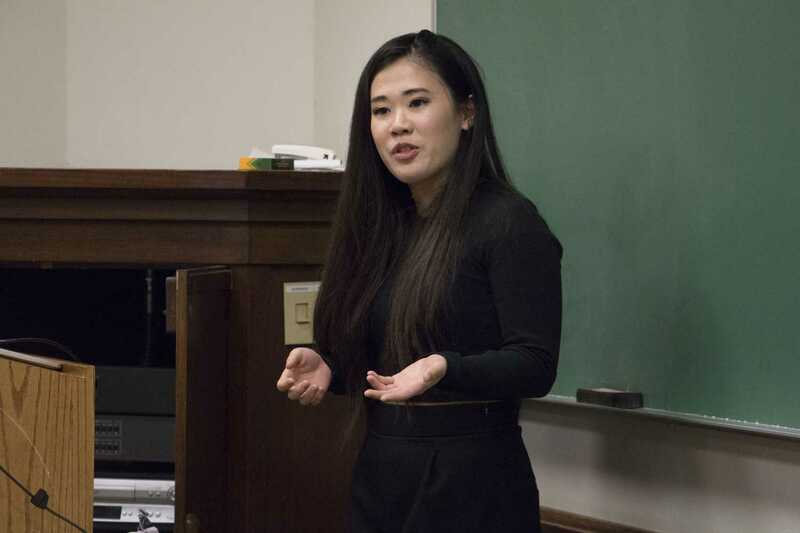 While many students were intrigued about the lifestyle of Wall Street, which Hirao was happy to discuss, her talk allowed students like Qin to get a stronger sense of the real-world applications of data analytics. “I think Emily did a great job talking about her experiences and shedding some wisdom on how other students can use these skills and succeed,” Qin said.